Cyclic adenosine monophosphate (cAMP) plays a pivotal role in gonadotrope responses in the pituitary. Gonadotropin-releasing hormone (GnRH) mediated synthesis and secretion of follicle-stimulating hormone (FSH) and luteinizing hormone (LH) are regulated by both the Gs/cAMP and Gq/Ca2+ signaling pathways. Pituitary adenylate cyclase-activating polypeptide (PACAP) also regulates GnRH responsiveness in gonadotropes through the PACAP receptor, which activates the Gs/cAMP signaling pathway. Therefore, measuring intracellular cAMP levels is important for elucidating the molecular mechanisms of FSH and LH synthesis and secretion in gonadotropes. The GloSensor cAMP assay is useful for detecting cAMP levels in intact, living cells. 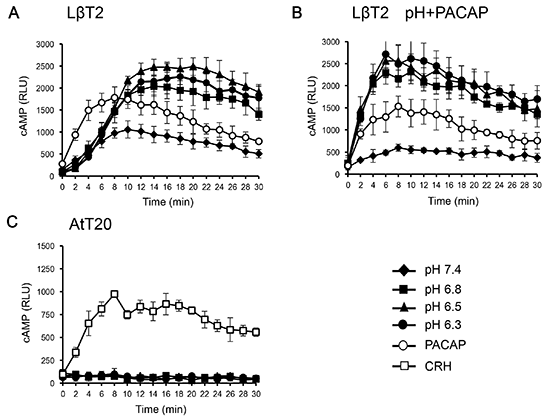 In this study, we found that increased GloSensor luminescence intensity did not correlate with cAMP accumulation in LβT2 cells under low pH conditions. This result indicates that cell type and condition must be considered when using GloSensor cAMP. Eggs are female germ cells that are required for producing offspring through sexual reproduction. In mammals, eggs are produced in the ovary and ovulated into the oviduct. It is well known that over 99% of eggs are degenerated without ovulation, so that many studies have attempted in vitro folliculogenesis to produce many eggs in different species for a few decades. Although many methods have been developed, a success of in vitro egg production with the resultant live birth of offspring has been limited, especially in livestock animals. More recently, we have succeeded in producing live pups derived from in vitro/ex vivo egg production in the mouse. This review aims to introduce our recent findings with a brief history of in vitro/ex vivo culture systems for follicles and ovaries. This study compared the effects of different volumes of culture medium for the in vitro growth of oocytes derived from porcine early antral follicles (EAFs). Oocyte granulosa cell complexes (OGCs) were collected from EAFs (0.5–0.7 mm in diameter) and individually cultured for 14 days. When OGCs were cultured in 1 ml of medium with or without polyacrylamide gel (PAG), the presence of PAG supported granulosa cell (GC) proliferation and oocyte growth. When OGCs were cultured in 0.2 or 1 ml of medium on PAG, the number of GC in the OGC culture and the developmental ability of the oocytes cultured in vitro were significantly higher for the 1 ml of culture medium group than for the 0.2 ml group. In conclusion, a combination of a large volume of culture medium with PAG improved the growth and developmental ability of the oocytes cultured in vitro, which were comparable to the oocytes collected from large antral follicles. The aim of this study was to develop a new container for cryopreservation of a limited number of spermatozoa. To evaluate the efficacy and safety of this new container, we performed preclinical evaluations using human sperm or mouse oocytes and sperm. First, using human sperm that was frozen and then thawed, we demonstrated that the sperm recovery rate using the new container was 96.7% (58/60), which was significantly higher (P < 0.05) than the recovery rate of 21.2% (11/52) when using the Cryotop®. Sperm motility rates were 19.2% (10/52) using the Cryotop® and 35.0% (21/60) using the new container. Second, murine epididymal spermatozoa were divided into three groups: fresh spermatozoa, spermatozoa frozen using a straw, and spermatozoa frozen using the new container. 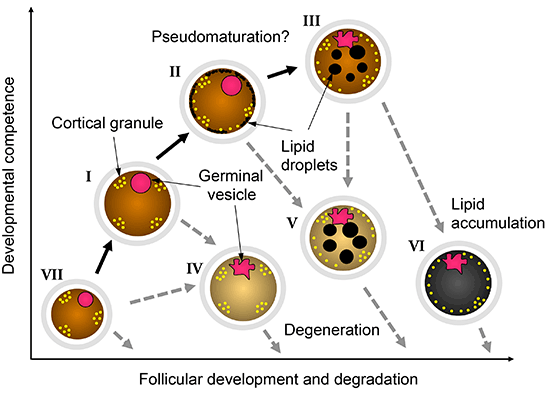 Sperm motility, sperm membrane and DNA integrity, in vitro development of fertilized eggs, and offspring development after embryo transfer were assessed. The motility of freeze–thawed sperm was lower in spermatozoa that were frozen using the new container than in fresh spermatozoa or those that were frozen using a straw. After intracytoplasmic sperm injection, the survival rate was 96.7% (145/150), the 2-cell development rate was 90.3% (131/145), and the blastocyst development rate was 77.2% (112/145), when using the new container. There were no differences in the sperm membrane, DNA integrity, or in the embryo development rates to the blastocyst stage among the different frozen groups. Six offspring were derived from spermatozoa freeze–thawed in the new container, and they developed normally. Thus, the new container allows easy handling of a small number of sperms and minimizes sperm loss during cryopreservation. In this study, we evaluated the efficiency of a single measurement of plasma anti-Müllerian hormone (AMH) concentration in heifers in determining the number of oocytes recoverable by ovum pick-up (OPU), and compared AMH concentrations among sister heifers from the same parents. For this, blood samples from 50 embryo-transfer-derived female Japanese Black (JB) heifers (mean: 8.7 age in months) were collected and plasma AMH concentration was measured. At 13–15 months of age, both the number of follicles (2–9 mm) and the number of collected oocytes after OPU were counted and compared. Results indicated that the heifers with the highest AMH concentration had the highest number of follicles in their ovaries and gave the highest number of collected oocytes with OPU, thereby indicating that a single measurement of plasma AMH concentration is informative for the selection of OPU-donor heifers in herd breeding programs. The practice of performing a single AMH measurement may accelerate the intensive breeding of JB herds. This article released online on January 18, 2019 as advance publication was withdrawn from consideration for publication in The Journal of Reproduction and Development at author’s request. In this study, we evaluated the effects of holding in vitro-produced bovine blastocysts under mild hypothermia (33°C or 35°C), by examining viability and hatching rates of day 7 blastocysts (day 0: in vitro fertilization) cultured for 6 days and transcriptional expression of cold-inducible transcription factors Cirp and Rbm3, implicated in mild hypothermia-induced cellular protection against various types of stress. In the normothermic control (38.5°C), viability of the embryos decreased rapidly after day 10, and most samples were degenerated on day 13. However, mild hypothermia, particularly at 33°C, resulted in maintenance of high embryonic survival rates until day 13 (77.1% on day 13) and significant increases in transcriptional expression of Rbm3 in day 11 embryos compared with those at 38.5°C. 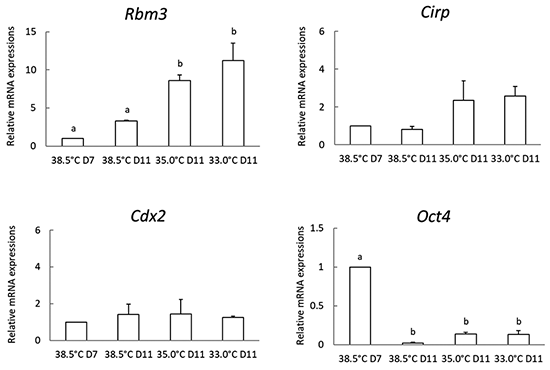 Thus, our results suggested that upregulation of Rbm3 may occur in response to mild hypothermia in many bovine embryos, providing insights into the effects of mild hypothermia on embryo quality. This study was carried out to examine the effects of manganese (Mn) on the developmental competence of porcine oocytes during in vitro maturation (IVM) after parthenogenetic activation (PA) and somatic cell nuclear transfer (SCNT). Upon treatment of porcine oocytes with different concentrations (0, 3, 6, and 12 ng/ml) of Mn during IVM, PA was performed to determine the optimum concentration. Following PA, the rate of blastocyst formation was higher significantly in treated porcine oocytes at 6 ng/ml of Mn than in other groups (P < 0.05). However, there was no substantial difference in the cleavage rate and total blastocyst cell numbers among all groups. SCNT was performed using the optimal concentration of Mn from PA, which showed an improved blastocyst formation rate in treated oocytes compared to that in control group (P < 0.05). However, the cleavage rate and total cell numbers per blastocyst were not different between the control and the Mn treated groups after SCNT. Additionally, oocyte nuclear maturation, intracellular glutathione (GSH), and reactive oxygen species (ROS) levels were assessed. There was no significant difference observed in nuclear maturation among all the groups. However, enhanced intracellular GSH levels while lower levels of ROS were seen in the Mn treated group compared to the control group (P < 0.05). Thus, these results indicate that Mn supplementation can improve the developmental competence of porcine PA and SCNT embryos by increasing GSH and decreasing ROS levels. Preimplantation genomic selection using genomic estimated breeding values (GEBVs) based on single nucleotide polymorphism (SNP) genotypes is expected to accelerate genetic improvement in cattle. To develop a preimplantation genomic selection system for carcass traits in Japanese Black cattle, we investigated the accuracy of genomic evaluation of carcass traits using biopsied embryonic cells (Experiment 1); we also performed an empirical evaluation for embryo transfer (ET) of vitrified GEBV-evaluated blastocysts to assess the efficiency of the preimplantation genomic selection system (Experiment 2). In Experiment 1, the mean call rate for SNP genotyping using approximately 15 biopsied cells was 98.1 ± 0.3%, whereas that for approximately 5 biopsied cells was 91.5 ± 2.4%. The mean concordance rate for called genotypes between ~15-cell biopsies and the corresponding biopsied embryos was 99.9 ± 0.02%. The GEBVs for carcass weight, ribeye area, and marbling score calculated from ~15-cell biopsies closely matched those from the corresponding calves produced by ET. In Experiment 2, a total of 208 in vivo blastocysts were biopsied (~15-cell) and the biopsied cells were processed for SNP genotyping, where 88.5% of the samples were found to be suitable for GEBV calculation. Large variations in GEBVs for carcass traits were observed among full-sib embryos and, among the embryos, some presented higher GEBVs for ribeye area and marbling score than their parents. The conception rate following ET of vitrified GEBV-evaluated blastocysts was 41.9% (13/31). These findings suggest the possible application of preimplantation genomic selection for carcass traits in Japanese Black cattle. Cynomolgus monkeys (Macaca fascicularis) are a valuable model organism for human disease modeling because human physiology and pathology are closer to those of cynomolgus monkeys than rodents. It has been widely reported that mature oocytes can be recovered from cynomolgus monkeys through ovarian stimulation by human follicle-stimulating hormone (hFSH). However, it is unknown whether mature oocytes can be effectively obtained through a second ovarian stimulation by hFSH. 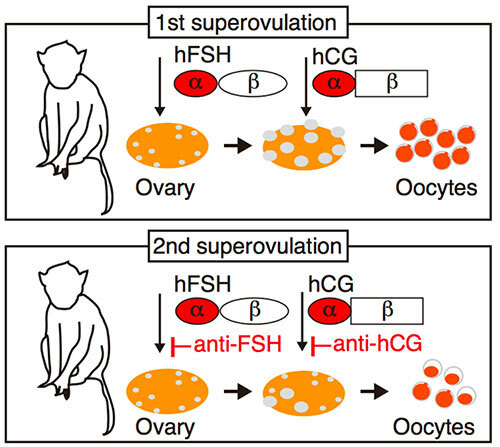 Here, we report that some ovaries (eight ovaries from 14 female monkeys) were stimulated effectively by hFSH even after the first ovum pick up, whereas the others were stimulated poorly by hFSH. Furthermore, we found antibodies against hFSH only in the serum of female monkeys with poorly stimulated ovaries. Collectively, these data suggest that anti-hFSH antibodies in serum may cause a poor ovarian response to hFSH stimulation. Finally, detection of such antibodies as well as observation of the ovary over the course of hFSH administration might be useful to predict favorable second ovarian stimulation by hFSH. The present study aimed to establish a zona free (handmade cloning) embryo production system for Pashmina goat embryos. Abattoir derived oocytes were matured in vitro; after maturation, oocytes were enucleated and fused with somatic cells derived from an adult Pashmina goat tissue. The reconstructs were activated using a calcium ionophore-DMAP procedure. The embryos were distributed into two experimental groups. In Experiment 1, the embryos were cultured in one of the following four culture media (i) G1.G2 media (ii) Modified synthetic oviduct fluid (mSOF) (iii) Research vitro cleave media (RVCL) and (iv) Embryo development media (EDM), and were cultured for 7 days. The cleavage rates in G1.G2, RVCL, and mSOF were higher than those in EDM (86.8, 82.4, 77.3, and 68.8%, respectively). Blastocyst rates were higher in RVCL than those in mSOF, EDM, and G1.G2 (15.0, 10.5, 4.9, and 2.2%, respectively). In experiment 2, the embryos were cultured in five different culture systems: (i) Flat surface (FS), (ii) Well in drop (WID), (iii) Well of well (WOW), (iv) Micro drop, and (v) Hanging drop, for 7 days. The cleavage rates in FS and WID were higher than those in WOW, Micro drop, and Hanging drop (84.3, 81.2, 73.6, 73.5, and 70.3%, respectively). The blastocyst rates were higher in WID than those in WOW, Micro drop, Hanging drop, and FS systems (21.6, 13.7, 11.5, 10.9, and 3.9%, respectively). The embryos produced in experiment 2 were transferred to synchronized recipients. Of the three pregnancies established on day 40, one resulted in the delivery of a healthy Pashmina kid. Recently, the demand of transferable embryos in cattle industry is increasing, and the number of embryos produced in vitro is also increasing in the world. Although oocytes are collected from individual elite cattle by ovum-pick up (OPU) and used for in vitro production (IVP) of embryos, the cattle are mono-ovulatory animal. It means that most of oocytes collected from ovaries are destined to degenerate. To improve the IVP efficiency, we should predict the developmental competence of oocytes correctly and culture them by the suitable way. In addition, in vitro production of bovine oocytes by in vitro growth (IVG) culture system will become a candidate of supply source of oocytes for IVP. If we can produce high competent oocytes by IVG, IVP efficiency will be improved and the genetic improvement of cattle will be dramatically accelerated. In the review, I introduce our researches related to oocyte morphology, the developmental competence, and the production of oocytes having high developmental competence by IVG culture. Piezo-actuated intracytoplasmic sperm injection (Piezo-ICSI) is used as an efficient in vitro fertilization method with various animals. With this method, elongated spermatids are collected from testicular tissues and are easier to obtain from animals that unexpectedly die than ejaculate sperm. Additionally, elongated spermatid injection often results in the development of embryos and offspring. To develop assisted reproductive techniques (ARTs) for domestic cats, we examined the effects of oocyte activation on cleavage and embryo development after Piezo-ICSI with motile sperm (experiment 1) and after Piezo-ICSI with either testicular sperm or elongated spermatids (experiment 2). 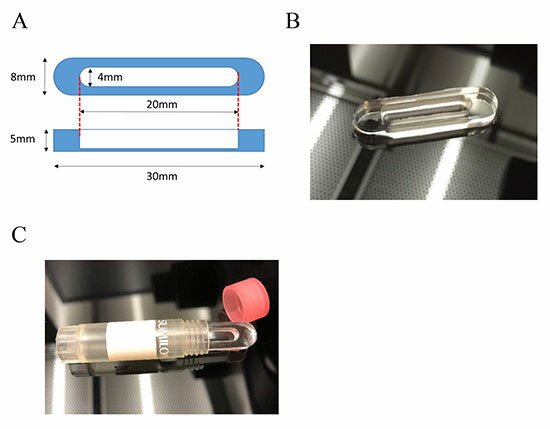 In experiment 1, the proportions of cleaved embryos, morulas, and blastocysts following Piezo-ICSI with ethanol activation were significantly higher (P < 0.05) than in the non-activated groups. However, the proportion of blastocysts and the blastocyst quality did not differ significantly (P > 0.05) between the ethanol-activated and non-activated groups. In experiment 2, the cleavage frequencies of oocytes after Piezo-ICSI of testicular sperm or elongated spermatids and ethanol activation were higher (P < 0.05) than that of oocytes in the non-activated group, but the occurrence of blastocyst formation and quality of blastocysts did not differ between the activated and non-activated groups. In summary, cat embryos can be produced by Piezo-actuated microinjection of elongated spermatids. 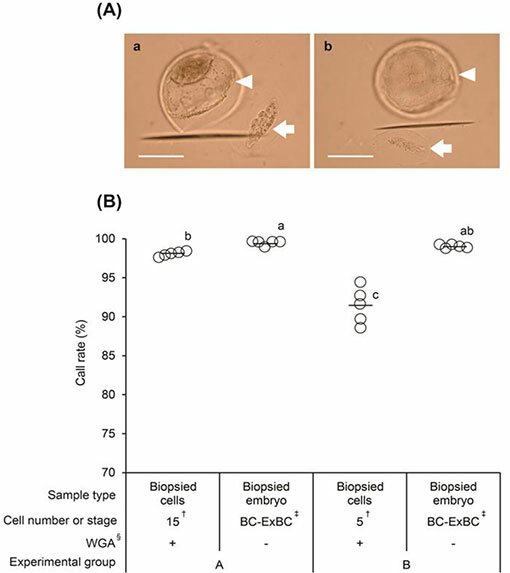 Ethanol activation increased the frequency of cleavage, but it affected neither the occurrence of blastocyst development nor the quality of blastocysts. These results represent an expansion in the repertoire of ARTs that are potentially applicable to both domestic and endangered species of cats. The partial or complete loss of one X chromosome in humans causes Turner syndrome (TS), which is accompanied by a range of physical and reproductive pathologies. This article reports similarities between the phenotype of a pig with monosomy X and the symptoms of TS in humans. Born as the offspring of a male pig carrying a mutation in an X-chromosomal gene, ornithine transcarbamylase (OTC), the female pig (37,XO) was raised to the age of 36 months. This X-monosomic pig presented with abnormal physical characteristics including short stature, micrognathia, and skeletal abnormalities in the limbs. Furthermore, the female did not exhibit an estrous cycle, even after reaching the age of sexual maturity, and showed no ovarian endocrine activity except for an irregular increase in blood 17β-estradiol levels, which was seemingly attributable to sporadic follicular development. An autopsy at 36 months revealed an undeveloped reproductive tract with ovaries that lacked follicles. 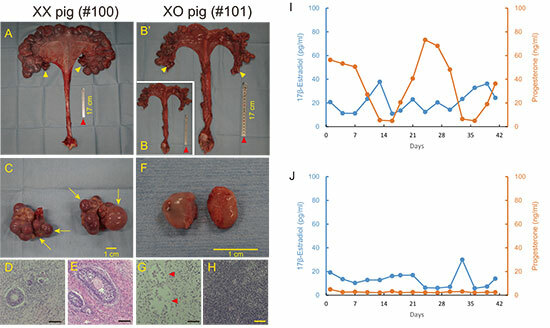 These data demonstrated that the growth processes and anatomical and physiological characteristics of an X-monosomic pig closely resembled those of a human with TS. All-trans retinoic acid (RA) is a metabolite of vitamin A and has pleiotropic actions on many different biological processes, including cell growth and differentiation, and is involved in different aspects of fertility and developmental biology. In the current study, we investigated the effects of RA on camel (Camelus dromedarius) cumulus-oocyte complex in vitro maturation (IVM). IVM medium was supplemented with 0, 10, 20, and 40 µM RA. Application of 20 µM RA significantly reduced the proportion of degenerated oocytes and significantly improved oocyte meiosis and first polar body extrusion compared to the control and other experimental groups. Retinoic acid significantly reduced the mRNA transcript levels of apoptosis-related genes, including BAX and P53, and reduced the BAX/BCL2 ratio. In addition, RA significantly reduced the expression of the Transforming growth factor beta (TGFβ) pathway-related transcripts associated with the actin cytoskeleton, ACTA2 and TAGLN; however, RA increased TGFβ expression in cumulus cells. The small molecule SB-431542 inhibits the TGFβ pathway by inhibiting the activity of activin receptor-like kinases (ALK-4, ALK-5, and ALK-7); however, combined supplementation with RA during IVM compensated for the inhibitory effect of SB-431542 on cumulus expansion, oocyte meiosis I, and first polar body extrusion in activated oocytes. 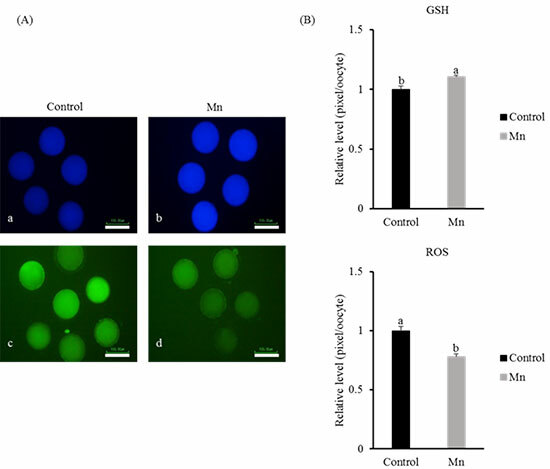 The current study shows the beneficial effects of RA on camel oocyte IVM and provides a model to study the multifunctional mechanisms involved in cumulus expansion and oocyte meiosis, particularly those involved in the TGFβ pathway. Preeclampsia is a systemic disease caused by abnormal placentation that affects both mother and fetus. It was reported that Laeverin (LVRN, also known as Aminopeptidase Q) was up-regulated in the placenta of preeclamptic patients. However, physiological and pathological functions of LVRN remained to be unknown. Here we characterized Lvrn function during placentation in mice. RT-PCR showed that Lvrn is expressed in both fetus and placenta during embryogenesis, and several adult tissues. When we overexpressed Lvrn in a placenta-specific manner using lentiviral vectors, we did not see any defects in both placentae and fetuses. The mice carrying Lvrn overexpressing placentas did not show any preeclampsia-like symptoms such as maternal high blood pressure and fetal growth restriction. We next ablated Lvrn by CRISPR/Cas9-mediated genome editing to see physiological function. In Lvrn ablated mice, maternal blood pressure during pregnancy was not affected, and both placentas and fetuses grew normally. 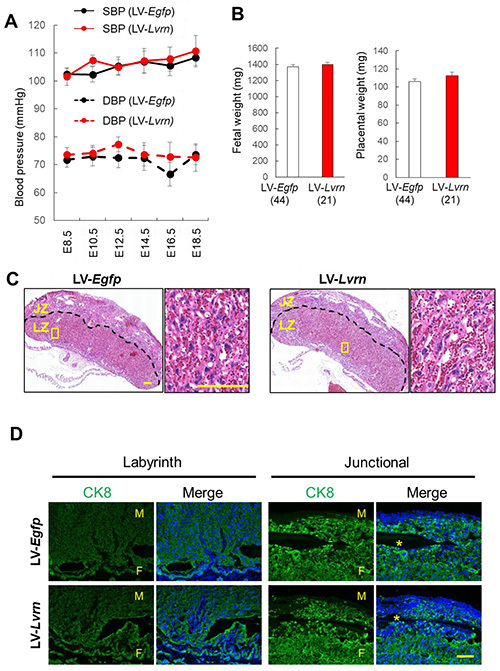 Collectively, these results suggest that, LVRN is irrelevant to preeclampsia and dispensable for normal placentation and embryonic development in mice. Maternal factors stored in eggs and oocytes are necessary for reprogramming sperm for embryonic development. This reprogramming activity of maternal factors also works towards somatic cells, including terminally differentiated cells. 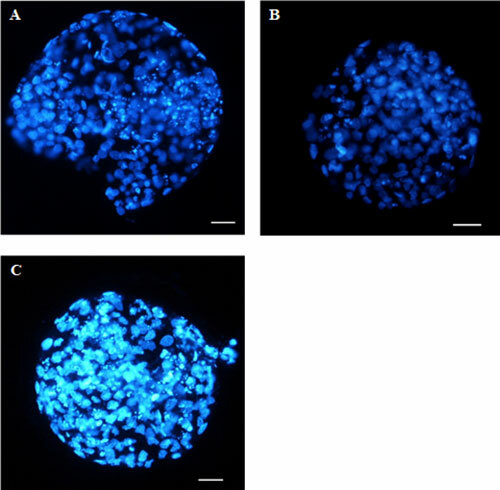 Several different experimental systems utilizing egg and oocyte materials have been applied to study nuclear reprogramming by maternal factors. Among these systems, the most widely used is the transfer of a somatic cell nucleus to an oocyte arrested at the metaphase II stage, leading to the production of a cloned animal. Nuclear transfer to an unfertilized oocyte thus provides a unique opportunity to examine reprogramming processes involved in acquiring totipotency. Other experimental systems are also available to study maternal reprogramming, such as nuclear transfer to Xenopus laevis oocytes at the germinal vesicle stage, treatment with extracts obtained from eggs or oocytes, and induced pluripotency with overexpressed maternal factors. Each system can be used for answering different types of scientific questions. 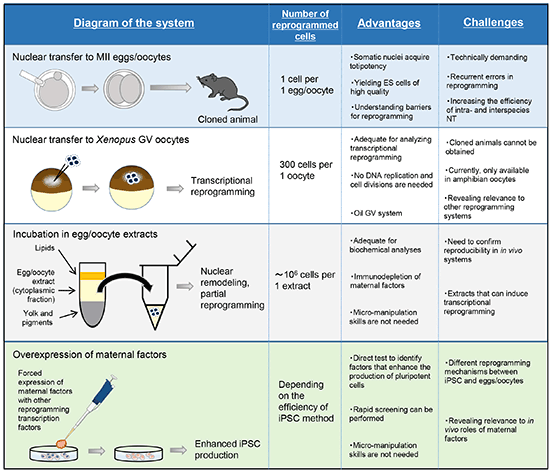 This review describes currently available reprogramming systems using egg and oocyte materials and discusses how we can deepen our understanding of reprogramming mechanisms by taking advantage of these various experimental systems. Repeat breeder cattle do not become pregnant until after three or more breeding attempts; this represents a critical reproductive disorder. Embryo transfer (ET) following artificial insemination (AI) in repeat breeder cattle reportedly improves pregnancy rate, leading to speculation that interferon tau (IFNT) is associated with this phenomenon. However, the reason why the conception rate improves remains unknown. We investigated the effect of ET following AI on repeat breeder cattle in field tests, and determined whether adding an embryo affects the maternal immune cells detected by interferon-stimulated genes (ISGs), marker genes of IFN response. In total, 1122 repeat breeder cattle were implanted with in vitro fertilization (IVF) embryos after previous AI. ET following AI resulted in pregnancy rates of 46.9% in repeat breeder dairy cattle. In basic in vivo tests, to investigate the effect of adding embryos, ISGs mRNA expression levels were significantly higher in the AI + ET group than in the AI + sham group (transfer of only embryonic cryopreservation solution). Then, we examined the effect of cultured conditioned media (CM) of IVF embryos on splenic immune cells and Madin-Darby bovine kidney (MDBK) cells with stably introduced ISG15 promoter-reporter constructs. These cells exhibited a specific increase in ISG15 mRNA expression and promoter activity when treated with the CM of IVF embryos, suggesting that IVF embryos have the potential to produce and release IFNT. In conclusion, ET following AI is beneficial for improving conception in repeat breeder cattle. Added embryos may produce and secrete IFNT, resulting in the increased expression of ISGs. Cytoplasmic microinjection (CI) of the CRISPR/Cas9 system enabled the induction of site-specific mutations in porcine zygotes and resulting pigs. However, mosaicism is a serious problem for genetically modified pigs. In the present study, we investigated suitable timing and concentration of CRISPR/Cas9 components for introduction into oocytes/zygotes by CI, to reduce mosaicism in the resulting blastocysts. First, we introduced 20 ng/μl of Cas9 protein and guide RNA (gRNA), targeting the α-1,3-galactosyltransferase (GalT) gene in oocytes before in vitro fertilization (IVF), in zygotes after IVF, or in oocytes/zygotes before and after IVF, twice. CI treatment had no detrimental effects on blastocyst formation rates. The highest value of the rate of mutant blastocysts was observed in zygotes injected after IVF. Next, we injected Cas9 protein and gRNA into zygotes after IVF at a concentration of 20 ng/μl each (20 ng/μl group) or 100 ng/μl each (100 ng/μl group). The ratio of the number of blastocysts that carried mutations to the total number of blastocysts examined in the 100 ng/μl group was significantly higher (P < 0.05) than that in the 20 ng/μl group. Although no blastocysts from the 20 ng/μl group carried a biallelic mutation, 16.7% of blastocysts from the 100 ng/μl group carried a biallelic mutation. 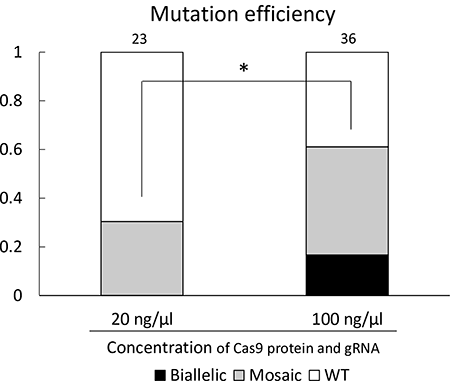 In conclusion, increasing the concentration of Cas9 protein and gRNA is effective in generating biallelic mutant blastocysts. To reduce mosaicism, however, further optimization of the timing of CI, and the concentration of CRISPR/Cas9 components, is needed. This article was retracted. See the Notification.